Language, in other words, is how we think. It's how we process information and remember. It's our operating system. Vygotsky (1962) suggested that thinking develops into words in a number of phases, moving from imaging to inner speech to inner speaking to speech. Tracing this idea backward, speech—talk—is the representation of thinking. As such, it seems reasonable to suggest that classrooms should be filled with talk, given that we want them filled with thinking! Academic discourse has always been part of the classroom. Teachers have long understood the importance of using language to transmit ideas. In the early history of education, teachers talked for most of the instructional day while students were quiet and completed their assigned tasks. Students were expected to memorize facts and be able to recite them. Remember that in most classrooms of the late 1800s, the age range was very diverse. In the same classroom, teachers might have students who were 5 or 6 years old and others who were 15 to 18. Talking by students was not the norm. In fact, students were punished for talking in class, even if the talk was academic! Teacher: I was thinking about the life cycle of an insect. Do you remember the life cycle we studied? Malik? Teacher: What was the first stage in the life cycle? Jesse? Teacher: Yes, things are born, but think about the life cycle of insects. Let's try to be more specific in our thinking. What is the first stage in the insect life cycle? Miriam? Teacher: Yes, insects start as eggs. Then they change and develop. They become larva after eggs, right? And then what? What happens to them after they are larva? Adrian? Teacher: They do eventually become adults, but there is a step missing. What is the step between larva and adults? What is that stage of the life cycle called? Joe? Teacher: Yes, there are two kinds of larva in the life cycle of some insects. But what I was thinking about was what happened to them after the larva before they become adults. Mariah? Teacher: Now we're talking about the three-stage cycle for some insects. Do the insects that change into nymphs come from larva? Let's look at our two posters again. Remember these? There is a three-stage process and a four-stage process. Let's study these again. Let's spend a few minutes analyzing this classroom exchange. First, it's not unlike many of the whole-class interactions we've seen, especially in a classroom where the students are obviously having a difficult time with the content. One student at a time is talking while the others listen or ignore the class. Second, the teacher is clearly using a lot of academic language, which is great. We know that teachers themselves have to use academic discourse if their students are ever going to have a chance to learn. Third, the balance of talk in this classroom is heavily weighted toward the teacher. If we count the number of words used, minus the student names, the teacher used 190 words, whereas the students used 11. This means that 94 percent of the words used in the classroom during this five-minute segment were spoken by the teacher. In addition, if we analyze the types of words used, half of the words spoken by the students were not academic in nature. That's not so great. Students need more time to talk, and this structure of asking them to do so one at a time will not significantly change the balance of talk in the classroom. As you reflect on this excerpt from the classroom, consider whether you think that the students will ever become proficient in using the language. Our experience suggests that these students will fail to develop academic language and discourse simply because they aren't provided opportunities to use words. They are hearing words but are not using them. We are reminded of Bakhtin's (1981) realization: "The world in language is half someone else's. It becomes 'one's own' only when the speaker populates it with his own intention, his own accent, when he appropriates the word, adapting it to his own semantic and expressive intention" (pp. 293–294). In other words, if students aren't using the words, they aren't developing academic discourse. As a result, we often think we've done a remarkable job teaching students and then wonder why they aren't learning. The key is for students to talk with one another, in purposeful ways, using academic language. Let's explore the importance of talk as the foundation for literacy next. Wilkinson (1965) introduced the term oracy as a way for people to think about the role that oral language plays in literacy development, defining it as "the ability to express oneself coherently and to communicate freely with others by word of mouth." Wilkinson noted that the development of oracy would lead to increased skill in reading and writing as users of the language became increasingly proficient—as James Britton (1983) put it so eloquently, "Reading and writing float on a sea of talk" (p. 11). Put simply, talk, or oracy, is the foundation of literacy. This should not come as a surprise to anyone. We have all observed that young children listen and speak well before they can read or write. Children learn to manipulate their environment with spoken words well before they learn to do so with written words. It seems that this pattern is developmental in nature and that our brains are wired for language. Young children learn that language is power and that they can use words to express their needs, wants, and desires. The problem with applying this developmental approach to English language learners and language learning in the classroom is that our students don't have years to learn to speak before they need to write. Historically, teachers did not introduce English language learners to print until they had developed their speaking skills—a misguided approach that does not take into account the fact that, in developing their primary language, English language learners have already learned much about language, including the role that it plays in interacting with others. At the other end of the spectrum of instructional practice, many teachers did not provide any oral language instruction because they believed that their students needed to develop reading proficiency (and make adequate yearly progress) as soon as possible. Instead of this either/or approach, English language learners need access to instruction that recognizes the symbiotic relationship among the four domains of language: listening, speaking, reading, and writing. Clearly, students must reach high levels of proficiency in reading and writing in order to be successful in school, at a university, and in virtually any career they may choose. We know that it takes time to reach those levels. We know that opportunities for students to talk in class also take time. So, given the little instructional time we have with them, how can we justify devoting a significant amount of that time to talk? We would argue, How can we not provide that time to talk? Telling students what you want them to know is certainly a faster way of addressing standards. But telling does not necessarily equate to learning. If indeed "reading and writing float on a sea of talk," then the time students spend engaged in academic conversations with their classmates is time well spent in developing not only oracy but precisely the high level of literacy that is our goal. In Chapter 3 we will explore how we can maximize use of instructional time to that end. Classroom talk is frequently limited and is used to check comprehension rather than develop thinking. Consistent with the example from the beginning of the chapter, researchers have found that teachers dominate classroom talk. For example, Lingard, Hayes, and Mills (2003) noted that in classrooms with higher numbers of students living in poverty, teachers talk more and students talk less. We also know that English language learners in many classrooms are asked easier questions or no questions at all and thus rarely have to talk in the classroom (Guan Eng Ho, 2005). Several decades ago, Flanders (1970) reported that teachers of high-achieving students spent about 55 percent of the class time talking, compared with 80 percent for teachers of low-achieving students. The problems inherent in this type of approach are multiple. First, in a classroom where we want students to talk—to practice and apply their developing knowledge of English—only one student has an opportunity to talk, and, as we see in this example, that talk does not require the use of even one complete sentence, let alone extended discourse. In a classroom where we want students to analyze, synthesize, and evaluate, neither does this type of interchange require them to engage in critical thinking. Instead, they may become frustrated as they struggle to "guess what's in the teacher's head" or become disengaged as they listen to the "popcorn" pattern of teacher question, student response, teacher question, student response, and so on. Last, in a classroom where assessment guides instruction, with each question the teacher learns that one student knows the answer but can make no determination regarding the understanding of the other 29 students in the classroom. In sum, talk is used in most classrooms but could be more effectively used to develop students' thinking. Teachers must take into account their English language learners' current proficiency levels when planning instruction. Linguistic. Although Spanish is the most common second language in the United States, students in a given school district might speak more than 100 different languages. These languages differ in their pronunciation patterns, orthographic representations, and histories—and thus in the ease with which students can transfer their prior knowledge about language to English. Proficiency in the home language. Students who speak the same language and are in the same grade may have very different levels of academic language proficiency in their home language depending on such factors as age and prior education. The development of a formal first language facilitates learning in additional languages. Generation. There are recognized differences in language proficiency for students of different generations living in the United States. First and second generations of English language learners differ in significant ways, including the ability to use English at home. Because protracted English language learners born outside the United States attempt to straddle their old world and the new world in which they live, they experience greater difficulty in developing English proficiency. Number of languages spoken. Some students enroll in schools having mastered more than one language already and thus have gained a linguistic flexibility that can aid in learning additional languages. Others have spoken one language at home for years, and their exposure to English is a new learning experience. Motivation. Students differ in their motivation to learn English depending on their migration, immigration, or birthplace. Immigrant families leave their homelands for a variety of reasons—political and economic are perhaps the most common. Many of our students have left loved ones behind, along with a familiar and cherished way of life. Some even hope to return when a war is ended or when the family has enough money to better their life in their home country. These students may not feel a great need to become proficient in a language they don't intend to use for very long. Poverty. Living in poverty and experiencing food insecurity have a profound impact on learning in general and language learning in particular. Simply said, when students' basic needs are met, they are more likely to excel in school. Personality. Some students are naturally outgoing and verbal; others are shy or prefer more independent activities. Some are risk takers who are not afraid to make mistakes; others want their utterances to be perfect. These differences in personality can lead to differences in the rate at which students gain proficiency in listening and speaking or reading and writing. … language to communicate with others around basic concrete needs. … high-frequency words and memorized chunks of language. … words, phrases, or chunks of language. … pictorial, graphic, or nonverbal representation of language. … language to draw on simple and routine experiences to communicate with others. … high-frequency and some general academic vocabulary and expressions. … phrases or short sentences in oral or written communication. … oral or written language, making errors that often impede the meaning of the communication. … language to communicate with others on familiar matters regularly encountered. … general and some specialized academic vocabulary and expressions. … expanded sentences in oral or written communication. … oral or written language, making errors that may impede the communication but retain much of its meaning. … language in both concrete and abstract situations and apply language to new experiences. … specialized and some technical academic vocabulary and expressions. … a variety of sentence lengths of varying linguistic complexity in oral and written communication. … oral or written language, making minimal errors that do not impede the overall meaning of the communication. … a wide range of longer oral and written texts and recognize implicit meaning. … technical academic vocabulary and expressions. … a variety of sentence lengths of varying linguistic complexity in extended oral or written discourse. … oral or written language approaching comparability to that of English-proficient peers. Source: TESOL (2006), PreK–12 English Language Proficiency Standards: Augmentation of the World-Class Instructional Design and Assessment (WIDA) Consortium English Language Proficiency Standards (Alexandria, VA: Author), p. 39. Used with permission. Starting. At this entry level, students have virtually no understanding of English and do not use English to communicate. They might respond to simple commands or questions, often nonverbally. Over time, they begin to imitate the oral language of those around them and will speak in one-word responses. Reading in English is very difficult, but students might recognize sight words or words that are similar to those in their home language. Pictorial representations are helpful, as are physical responses. When students who are starting to learn English write, they exhibit a number of unconventional spellings and grammatical errors. Emerging. As students are introduced to academic English appropriate for their age, their language emerges. Students at this level begin to understand phrases and simple sentences. They begin to communicate their needs, wants, and desires, especially using familiar and often memorized phrases or word groupings. In addition, they begin to speak in sentences but often make syntax errors in doing so. When they read and write in English, they can recognize familiar and high-frequency words. They can also copy information but make errors in grammar that interfere with effective communication. Developing. During this phase, students add considerably to their vocabulary. They use English spontaneously and are generally understood but often experience difficulty expressing feelings and other abstract ideas and continue to make grammar errors. As a group, they continue to produce simple sentences but understand sentences that are much more complex. They read increasingly complex texts and write more coherent information. Although their writing typically contains a number of errors and nonconventional forms, students in this place are able to demonstrate their thinking and understanding of the tasks at hand. Expanding. At this level, students' language skills are sufficient for most daily communication tasks. Although they make occasional structural errors, the majority of their communication is clear. They participate in discussions and use English in unfamiliar settings, though idioms and other figurative language forms may present a challenge. Generally, students at this level can read well enough to gain information from a text and write fairly independently; however, their writing is typically scored below grade level because they use less sophisticated text structures and vocabulary. Bridging. At this advanced level of proficiency, students generally perform well across the language domains of speaking, listening, reading, and writing. Their speech becomes increasingly fluent, and they can discuss a variety of topics with ease. They can do grade-level work but may need some guidance for technical writing and reading. After considering each of these proficiency levels, it's easy to see the importance of talking. At each level, the development of oral language is related to developing skills in written language. Equally important is the fact that reading and writing are not deferred while speech develops; rather, students are reading, writing, speaking, and listening from the beginning of their introduction into English. In addition, these English language learners are wrestling with what they know and do not know regarding language functions and registers, both of which are informed by the context of the discourse—mode, topic, purpose, audience, setting, and so forth. Figure 1.2 provides a graphic representation of the opportunities for integrating talk in the classroom. We've divided the opportunities for talk into four major categories. These categories are consistent with a gradual release of responsibility model of instruction, which acknowledges that students must assume increasing responsibility if they are to learn (Fisher & Frey, 2008). This does not mean that students are supposed to become independent learners in the absence of the teacher but, rather, that classrooms are structured in such a way that students are introduced to ideas and then have opportunities to work with these ideas before being expected to complete tasks independently. As you'll see throughout this book, a number of instructional strategies are available for integrating purposeful student talk. For now, let's consider the instructional routines in which talk can be integrated. During whole-class instruction, teachers model behaviors, skills, and strategies that they expect to see from their students. As we will discuss in Chapter 3, this modeling is based on an established purpose and provides students with a mental model for completing tasks they will encounter in another phase of instruction. We've already seen that questioning can be used during teacher modeling, but teachers can also activate their students' background knowledge during this time (for example, a 10th grade biology teacher might ask his students to talk with a partner about cell life before he explains cell division to them). In addition, teachers model the use of academic language as they engage in think alouds, shared readings, read alouds, lectures, and other whole-class events. After modeling, students can reflect on what they learned through both writing independently and talking with a partner. During guided instructional events, teachers use talk to determine what students know and what they still need to know. This is an opportunity to use questions, prompts, and cues to help students complete tasks. Although guided instruction is teacher led, this does not mean that students are not talking. They use talk to ask questions—of the teacher, of peers, and of themselves—as well as to clarify understanding, provide feedback to a partner, and reflect once more on their learning. As we will see in subsequent chapters, teachers can use talk during guided instruction in a number of ways. For example, an art teacher might meet with a small group of students who have difficulty with perspective in their drawings. He asks them to compare and contrast several drawings from his collections of books and then has them give one-word explanations of the differences. The students use words such as proportion, line, and shading. Through talk, this art teacher is able to facilitate increased understanding for his students. In this phase of instruction, students are provided an opportunity to work together, with the teacher monitoring and supporting as needed. Talk becomes critical when students discuss tasks or ideas and question one another, negotiate meaning, clarify their own understanding, and make their ideas comprehensible to their partners. 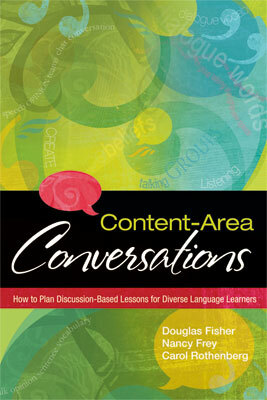 It is during collaborative tasks that students must use academic language if they are to focus on the content. Here again, their understanding grows as they talk with their partners to reflect on their learning. A number of classroom structures, such as reciprocal teaching, literature circles, partner discussions, and so on, require students to talk together. Our experience suggests that this phase of instruction is critical for English language learners to use the language and, as Bakhtin noted, own the words and ideas. It might seem strange to suggest that talk plays a critical role during independent activities. But think about the self-talk (inner speaking) you use when you complete independent tasks. Some of this self-talk occurs in your mind, whereas some is vocalized. Again, thinking occurs as we use language, and this type of talk is an important aspect to learning. As students work independently, they may also use talk to receive input on their work and give feedback to others. Reporting out after independent work may require a more formal register of language than that used during collaborative activities. As an example of the type of instruction in which talk permeates the learning environment, let us peek inside a 5th grade classroom as students read and discuss Hattie Big Sky (Larson, 2006). The teacher has just finished reading a chapter aloud. As she was reading, she regularly paused to provide context clues for vocabulary words. For example, when she came to the word skyscraper, she paused and commented, "What a great word! I know from the context that it's a type of building, but I can really see this in my mind. The big tall buildings in Chicago must have seemed to really scrape the sky. Have you seen buildings like that? Describe a skyscraper to your partner." At that moment, the classroom bursts into talk. Teresa leans over to Javier and says, "Like totally covered in glass, you know, all shiny so that you can see yourself. It's so big, you can see the ocean when you're up there." After the reading and think aloud, the teacher asks students to think about the differences in life in San Diego today and Montana in 1918. She says, "There are two things on my mind that we should talk about. There are differences and similarities between San Diego and the town Hattie lives in: Vida, Montana. And there are also differences and similarities between today and 1918. Choose one of those topics to discuss with your partner." Pedro turns to Alex and says, "They had nice people and mean people, just like we do. But they got bad weather and we don't." Alex responds, "Yeah, and they have farms and we don't, but they have chores like we do." Following the whole-class and partner discussions, students moved to their collaborative learning groups. The teacher had purposefully organized the membership in these groups such that students at the beginning levels of English proficiency had access to language brokers who could support their participation. She also focused on creating groups with diverse interests and skill levels such that the group would become interdependent as they processed information. Hattie: I gotta get my chores done but I'm so cold. Narrator: What will I do? I don't want to freeze to death. Hattie: I put on all of my clothes at once, every stitch. That will help me face the extreme cold. Mr. Whiskers: I'm not going outside with you—you're crazy! But there might be milk. I guess I'll go. Narrator: The cow was waiting so Hattie braved the weather. Hattie: Oh, hello. Do you want some coffee? I'm almost done and could use some company. The class continued on with productive group work and all of the talk associated with it. In this classroom, the teacher and her students share the responsibility for talking. Importantly, not just one student talks at a time; during partner conversations, 50 percent of the students are talking at a time. The important thing to remember is that this talk has to be purposeful; it can't just be social if we are going to see improvements in achievement. As we analyze why many students are not learning what we are teaching, we must evaluate our own practice for evidence of student talk throughout the day. Oral language is the foundation of literacy, and as such, it requires focused attention in planning. Altering the ratio of teacher to student talk doesn't just happen. Rather, it occurs through both believing in the importance of student talk and planning with a clear purpose and expectations. But before we discuss how to plan lessons that integrate purposeful academic talk, reading, and writing, we must be clear on our own understanding of exactly what academic oral discourse is. We turn our attention now to an analysis of the elements of discourse in the classroom.